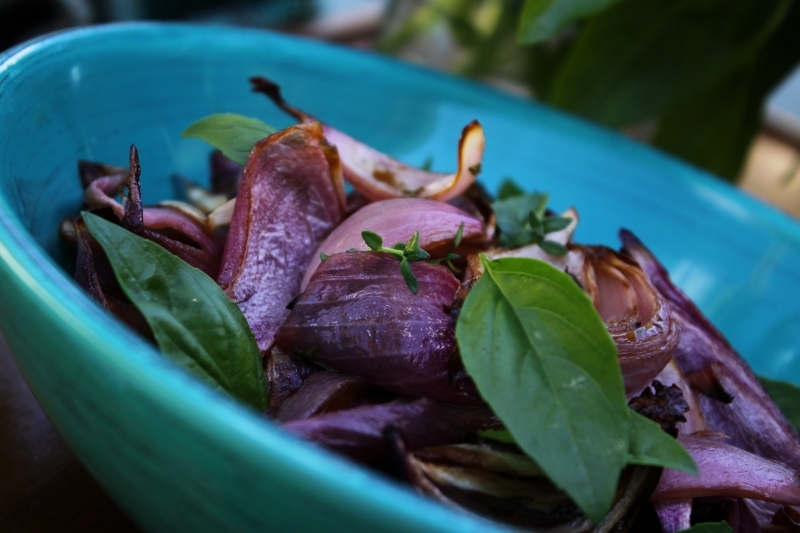 Onions are an integral part of my cooking, and their sweet, aromatic flavour adds depth and intensity to so many dishes. But in this dish they shine on their own. I saw something like this on Nigella Lawson’s Nigellisima Italian themed cooking show, and have been itching to make a version of my own ever since. We grow our own basil and at this time of year I have a ridiculous amount of this sweet, fragrant herb to use in my cooking. Even making pesto once a week does not keep on top of it, so any new recipe I can think of that uses basil is welcome. These onions are really delicious with grilled lamb or chicken and good crusty bread to soak up the juices. Preheat oven to 180C. Place the onions in a roasting dish large enough to fit them in a single layer. Add the thyme (saving a few sprigs) and olive oil and toss to coat. Season well with salt and pepper and roast, uncovered for about 1 hour, turning occasionally, until the onions are soft and starting to blacken slightly at the edges. Pour over the balsamic vinegar and brown sugar and then carefully stir through until well mixed. Place back in the oven for a further 5 minutes. Carefully pick out the thyme and let the onions cool a little, before piling into a serving bowl and scattering with the basil and the remaining thyme leaves. Serve straight away. Plus, they are super cheap AND you can find em anywhere. We love onions, too. Especially red ones! Beautiful photos – looks delicious! Yes, it’s expensive but there is a huge different between balsamic and normal wine vinegar. It’s sweet, much more delicate and can be used in many recipes without covering the taste of the other ingredients, but actually enriching the flavours.